If you are a regular subscriber to the 5 o’clock rush, you will know that my recipes or daily dinners are made up on the fly around the witching hour of 4pm. This Moroccan Roasted Vegetable Stew is no exception. On the Sunday night, I roasted 2 pork tenderloins with 2 different spice blends to be made into a recipe for our upcoming busy week. Not knowing what I would use them for, one tenderloin was coated with a Harissa spice blend that has red chilli flakes, garlic, cumin, caraway, coriander and spearmint. And the other tenderloin was coated with Greek or “souvlaki” style spices. On the Monday, fall had arrived in southern Ontario and a warm home cooked comfort dinner for the crisp weather outside was in order. 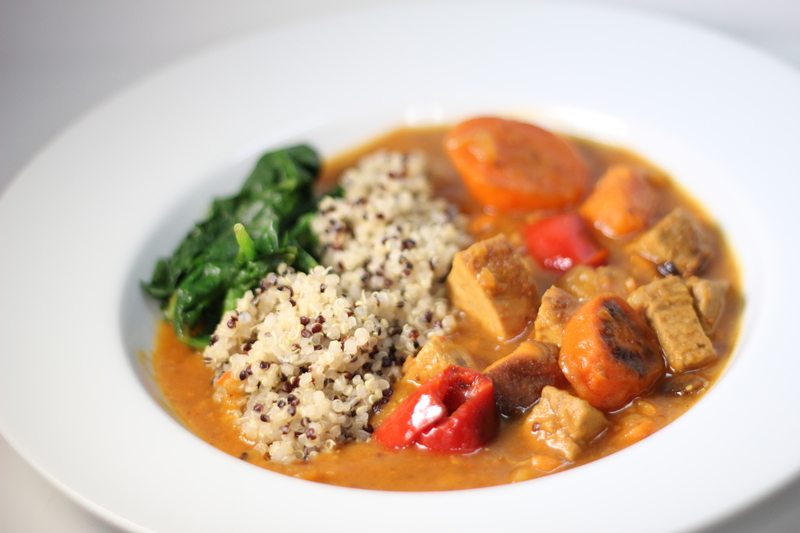 This is where the spicy pork tenderloin evolved into a delicious and super easy Moroccan stew. 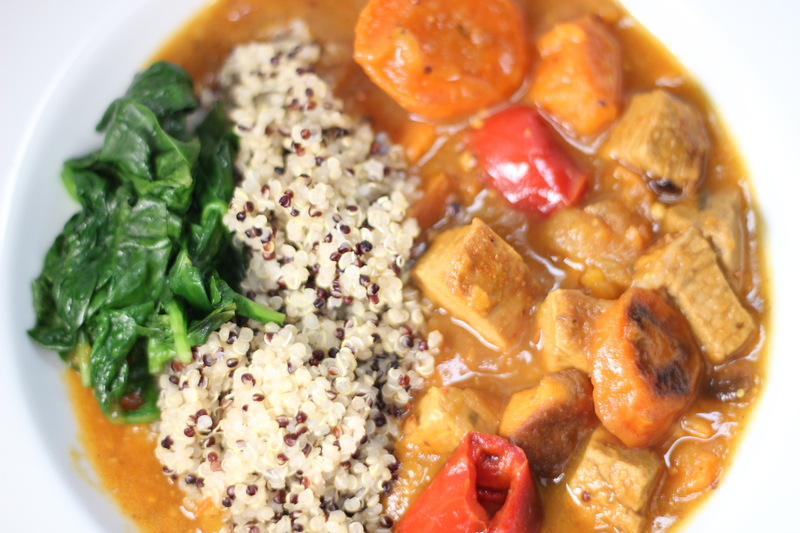 For our dinner I served the Moroccan Roasted Vegetable and Pork Tenderloin Stew over organic quinoa and steamed spinach. It was a hit with the famjam even my 13 yr. old son who is extremely picky. I also sent some leftovers to a friend for her workday lunch and it received raves reviews. Cover a 3 sheet pans with aluminum foil and coat with cooking spray or coconut oil. Place cleaned pork tenderloin on the first of 3 prepared sheet pans, rub with olive oil and coat generously with PC™Harissa spice blend. Place in a 400℉ oven for approximately 35-40min until cooked and firm to the touch. Place the peeled and cubed sweet potatoes and carrots on the second prepared sheet pan. Uniform cubes will help the vegetables cook at the same time on the same sheet pan. Don’t overcrowd the sheet pan. The purpose is to roast the vegetables; not steam them. On the last of the 3 prepared sheet pans add the cleaned red and cubanelle peppers and apple pieces. Coat vegetables with your oil of choice*. Sprinkle with salt and pepper. Place the garlic cloves on a small piece of aluminum foil with a little coconut oil and fold closed and place in oven. Place the pans with the vegetables in the oven to roast for approximately 35-40 min; give them one or two stirs throughout. To check doneness you are looking a nice caramelized and crispy outside, and a just-cooked-through inside.The sheet pan with the peppers will roast in less time approximately 15-20 min. than the sweet potato and carrot sheet pan. While the vegetables are roasting, make the roux, in a large heavy bottom pot. Melt the coconut oil. Whisk in the flour or coconut flour if using. Cook the roux at medium high until the mixture is a golden to deep brown approximately 10-12 min. Stir the flour and coconut oil continuously. Flavour and colour of the roux will determine the richness of the stew. Reduce to low heat. Slowly while whisking to prevent lumps add water to the pot. Add in the Knorr® vegetable stock concentrate. Whisk until the concentrate is dissolved. Add in the peeled yellow tomatoes, mustard, and PC Memories of® Dad’s Grill. Smash and chopped the roasted garlic cloves and add to stew pot. Add turmeric, salt and paprika. Switch to spoon and stir; cook for 5-7 minutes on medium heat. Cube the pork tenderloin into bite size pieces. Add to the stew pot. Add roasted vegetables. Cook the stew for approximately 20 min. on a medium low heat to blend flavours. Taste and adjust seasoning if necessary. All the components are cook so you are incorporating the components into the stew for flavour. It will get even better the next day. The longer the stew is cooked the more the vegetables will break down in the sauce. Removing the pork tenderloin and adding more vegetables could easily transform this stew into a vegetarian version. Roasted cauliflower, mini potatoes and/or butternut squash would all be good additions to bump up the amount of vegetables. Also adding canned beans is a great option. It would also good with other meats such as chicken thighs. **Coconut flour is a great alternative for those with gluten allergies. I did not make my version with coconut flour, so I cannot determine the cooking time for this alternative at time of post. ***Sometimes when I’m making dinner or recipes, I scourging in the fridge looking to use up leftovers or condiments. A lot of “bottom of the jar” is incorporated into my recipes. That is why the PC Memories of Dad’s Grill and grainy mustard are used in this recipe. I did “measure” the ingredients so the recipe could be recreated in your kitchen. The Dad’s Grill is an apple based BBQ sauce and you could swap in an unsweetened applesauce or BBQ sauce. And a Dijon or yellow mustard could also work but not necessary as 3 tbsp. in a big pot of stew will not be huge factor.